Cyber Monday Arrives Two Weeks Early at Lands' End | Lands' End, Inc.
DODGEVILLE, Wis., Nov. 12, 2018 /PRNewswire/ -- Lands' End is kicking off Cyber Monday two weeks early, today, Monday, November 12, with amazing offers on gifts for everyone on the list. The retailer is offering 50 percent off of all regular-priced items both online and in store. In addition to the incredible company-wide promotion, Lands' End is also shining a spotlight on the company's iconic canvas totes and coordinating pouches as the ultimate personalized gifts to celebrate #MonogramMonday. "As customers are creating their gift lists and holiday to-do's, we want to celebrate the start of the holiday shopping season with a sneak peek event to highlight our favorite Lands' End gifts," said Sarah Rasmusen, senior vice president, e-commerce, Lands' End. "We have beautiful cashmere sweaters, long down coats, flannel shirts and matching Christmas pajamas for the entire family and much, much more. With all these gift options available now, we didn't want to wait to share our holiday excitement." 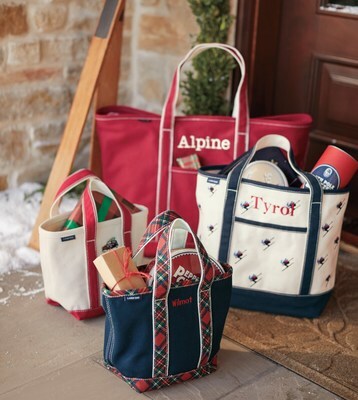 Lands' End highlights the best personalized gifts of the season and today for #MonogramMonday, the company is featuring one of the most iconic monogrammable gifts – the Lands' End Canvas Totes, along with coordinating canvas pouches. Purchase a canvas tote or pouch today and receive 50 percent off*.